You’re sure to enjoy your night out as you are instructed through a 16”x20” painting of Little One. Whether you come alone, with friends, for your first date or 50th, you can bet you’ll leave with a masterpiece! The evening begins at 6:30 and lasts about two hours. Make sure you come about 20 minutes early to settle in! You’re sure to enjoy your night out as you are instructed through a 12”x12” painting of Shimmering Sea. Discover the beauty of gold foil, and learn to paint with a palette knife! Whether you come alone, with friends, for your first date or 50th, you can bet you’ll leave with a masterpiece! The evening begins at 6:30 and lasts about two and a half hours. Make sure you come about 20 minutes early to settle in! Come see our brand new studio at 29 Manitou Drive in Kitchener. Join us for a BBQ lunch, and the ribbon cutting with the Mayor at 1:00! You’re sure to enjoy your night out as you are instructed through a 16”x20” painting of Just Beachy. Whether you come alone, with friends, for your first date or 50th, you can bet you’ll leave with a masterpiece! The evening begins at 6:30 and lasts about two hours. Make sure you come about 20 minutes early to settle in! You’re sure to enjoy your afternoon out as you are instructed through a 16”x20” painting of No Prob-llama! This is an all ages event, perfect for ages 5 and up! Parents are welcome to watch/help, or paint their own., but must stay on site for duration of class. The class begins at 6:00pm and lasts 1.5-2 hours. Make sure you come a few minutes early to settle in! Drop in from 10am-noon and work on anything you want! Have you had your eye on a painting in our collection? Working on a project of your own? Want to keep the kids (ages 6 and up) entertained for a couple hours? Come on down to the Social Art studio and create!! You’re sure to enjoy your night out as you are instructed through a 16”x20” painting of Dreamy Night. Whether you come alone, with friends, for your first date or 50th, you can bet you’ll leave with a masterpiece! The evening begins at 6:30 and lasts about two hours. Make sure you come about 20 minutes early to settle in! You’re sure to enjoy your night out as you are instructed through a 16”x20” painting of Friendly Giant. Whether you come alone, with friends, for your first date or 50th, you can bet you’ll leave with a masterpiece! The evening begins at 6:30 and lasts about two hours. Make sure you come about 20 minutes early to settle in! You’re sure to enjoy your night out as you are instructed through a 12”x24” painting of Rose Garden. Whether you come alone, with friends, for your first date or 50th, you can bet you’ll leave with a masterpiece! The evening begins at 6:30 and lasts about two hours. Make sure you come about 20 minutes early to settle in! You’re sure to enjoy your night out as you are instructed through a 16”x20” painting of Owl Eye. Whether you come alone, with friends, for your first date or 50th, you can bet you’ll leave with a masterpiece! The evening begins at 6:30 and lasts about two hours. Make sure you come about 20 minutes early to settle in! You’re sure to enjoy your afternoon out as you are instructed through a 16”x20” painting of Rainbow Unicorn! This is an all ages event, perfect for ages 5 and up! Parents are welcome to watch/help, or paint their own., but must stay on site for duration of class. The class begins at 10:00am and lasts 1.5-2 hours. Make sure you come a few minutes early to settle in! You’re sure to enjoy your night out as you are instructed through a 16”x20” painting of Tillys’s Snowflakes. Whether you come alone, with friends, for your first date or 50th, you can bet you’ll leave with a masterpiece! The evening begins at 6:30 and lasts about two hours. Make sure you come about 20 minutes early to settle in! You’re sure to enjoy your night out as you are instructed through a 16”x20” painting of A Lil Bit Country! Whether you come alone, with friends, for your first date or 50th, you can bet you’ll leave with a masterpiece! The evening begins at 6:30 and lasts about two hours. Make sure you come about 20 minutes early to settle in! You’re sure to enjoy your night out as you are instructed through a 16”x20” painting of Lakeside. Whether you come alone, with friends, for your first date or 50th, you can bet you’ll leave with a masterpiece! The evening begins at 6:30 and lasts about two hours. Make sure you come about 20 minutes early to settle in! You’re sure to enjoy your night out as you are instructed through a 16”x20” painting of Nuzzle. Whether you come alone, with friends, for your first date or 50th, you can bet you’ll leave with a masterpiece! The evening begins at 6:30 and lasts about two hours. Make sure you come about 20 minutes early to settle in! It's time for another date night to celebrate Valentines Day! 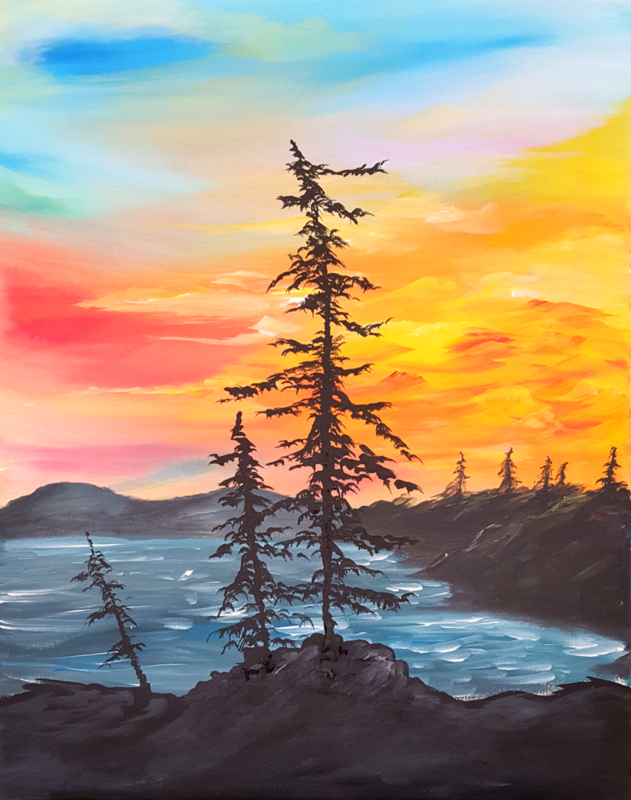 Bring your favourite guy or gal, best friend, mom.... and work together to create a beautiful double-canvas work of art! Each person will have their own canvas, and when joined together, the two create one large painting! You’re sure to enjoy your night out as you are instructed through a two 16”x20” canvas painting of Love Birds! The evening begins at 6:30 and lasts about two hours. Make sure you come about 20 minutes early to settle in! 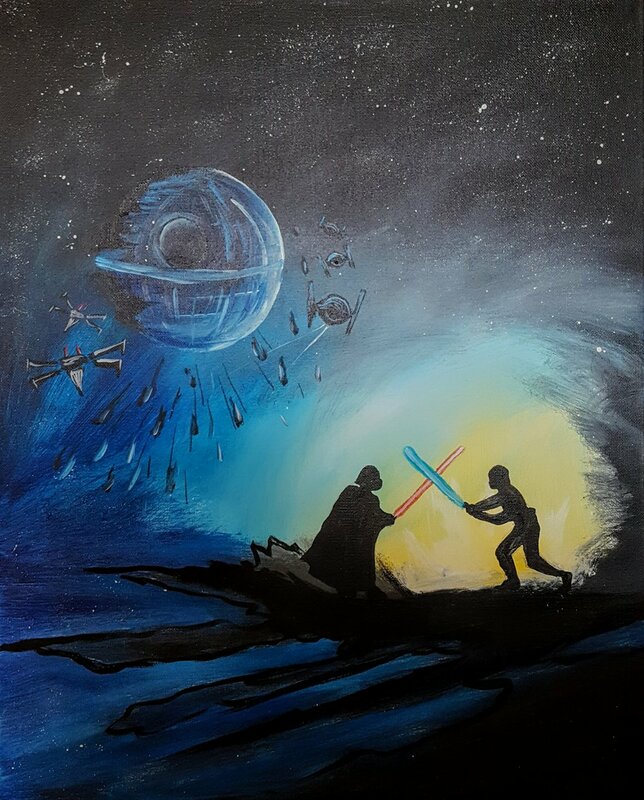 You’re sure to enjoy your night out as you are instructed through a 16”x20” painting of Make A Wish. Whether you come alone, with friends, for your first date or 50th, you can bet you’ll leave with a masterpiece! The evening begins at 6:30 and lasts about two hours. Make sure you come about 20 minutes early to settle in! You’re sure to enjoy your night out as you are instructed through a 16”x20” painting of Rainbow Unicorn. Whether you come alone, with friends or family, for your first date or 50th, you can bet you’ll leave with a masterpiece! The evening begins at 6:30 and lasts about two hours. Make sure you come about 20 minutes early to settle in! You’re sure to enjoy your night out as you are instructed through a 16”x20” painting of Eiffel Love. Whether you come alone, with friends, for your first date or 50th, you can bet you’ll leave with a masterpiece! The evening begins at 6:30 and lasts about two hours. Make sure you come about 20 minutes early to settle in! New Painting! New canvas size! New Techniques! You’re sure to enjoy your night out as you are instructed through a 12”x12” painting of Tropical Sunset! Learn to paint with a palette knife and create texture with molding paste! Whether you come alone, with friends, for your first date or 50th, you can bet you’ll leave with a masterpiece! The evening begins at 6:30 and lasts about two hours. Make sure you come about 20 minutes early to settle in!